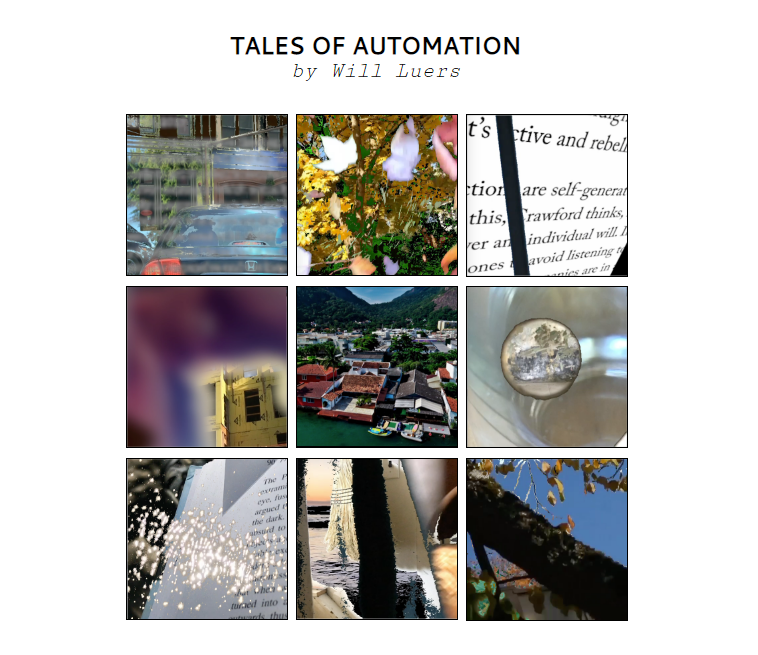 Tales of Automation is a collection of nine short "tales" that explore the effects of digital automation - algorithmic behavior modification, quantified feedback, life-logging, etc. - on daily life and subjectivity. Each tale is a never-ending cycle of asynchronous loops (of text and video) that present a single character at a moment of distracted attention, attempting and always failing to self-narrate experience in its complexity, materiality and abstraction. Notifications, data and spam intrude on consciousness at the cusp of self-awareness. Vision is composited, filtered and collaged. The multiplicity and variability of nested loops means that the short fictions are without beginnings or ends, or rather they begin in medias res and end when the nature of the characters' situation becomes evident. The work is best presented in full screen mode on any browser, but preferably Chrome. Interaction with each tale involves a simple click, page scroll or mouse movement. In Tale 7, the central image can be dragged to read what is underneath. There is no sound in this work.